The Cubs have been hovering around the .500 mark all season, following their championship with a performance that’s alternately been reminiscent of last year’s dominance and, uh, very much not so. A week after it looked like they might have finally hit their stride—winning seven of ten to launch them over the surprisingly successful Brewers for first place in the NL Central—they’ve slid right back down to a new low. That sort of slump won’t last forever, because when the bar for improvement is this low, there really aren’t any other options. But it does highlight a weaker spot for the team that seems like it’s been somewhat overlooked so far. Most of the focus on the Cubs’ lackluster performance this season has been on the rotation’s struggles, and rightfully so—Kyle Hendricks looks human again, Jake Arrieta’s velocity is gone, John Lackey has been terrible, Jon Lester has been largely adequate but far from outstanding. It would have been nearly impossible for the starting staff to live up to the mark they set last year, with a team ERA of 2.96 and FIP of 3.72, but this season has been rougher than it had to be. See: the rotation is currently sporting a collective 4.64 ERA and 4.19 FIP. 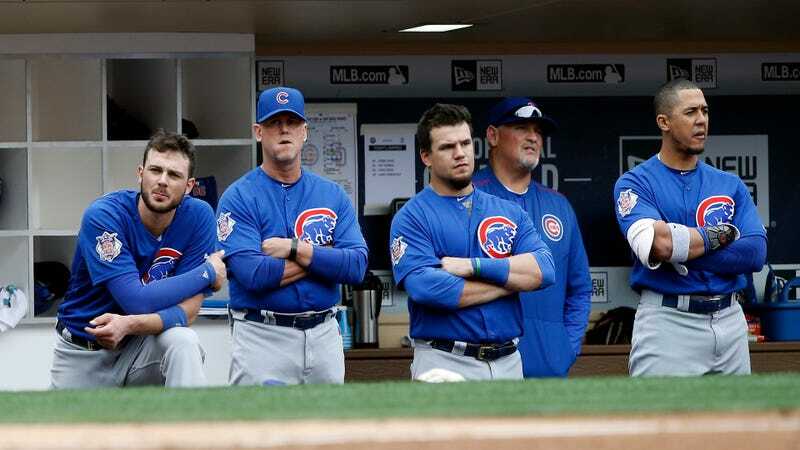 So, yes, the pitching has understandably gotten most of the attention and most of the blame for the fact that the Cubs have gone from baseball’s most dominant team to something solidly middle-of-the-road. But the offense has had its share of rough spots, too. Anthony Rizzo has been a shell of himself, with an OPS+ of 116 after topping 145 for three straight seasons. All of the progress that Addison Russell made at the plate last year has disappeared. Kyle Schwarber has completely failed to live up to expectations. As a team, they’re hitting .235/.324/.404, compared to last year’s final line of .256/.343/.429. This week has been bad for the Cubs, and it’s been especially bad for their offense. It’s guaranteed to get better on some level, sure—but they’ve left an awfully, awfully big gap between better than this and what they did last year.